This week Lisa chats with Murray Guest. They focus on embedding strengths into your company culture after StrengthsFinder training. Instead of just participating in a training, then putting your results and notes away, find ways to sustain the use of strengths at work and home. Using your strengths will improve your company culture, inspire your team to learn and grow, and increase your bottom line (and it will improve your family life too)! 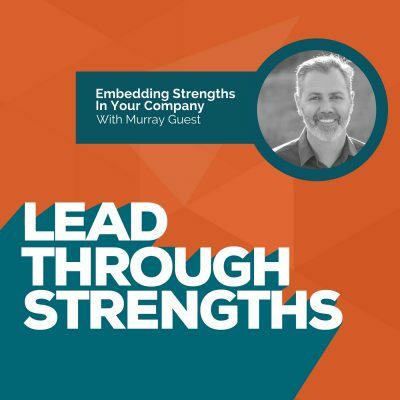 Murray is a consultant who works with companies and leaders to weave StrengthsFinder into their businesses. He shares this list of four things he addresses when helping people build strengths-based cultures: 1. Systems 2. Physical Environment 3. Leadership 4. Attitudes. He and Lisa also give a ton of easy-to-implement ideas to infuse strengths into your everyday life, most of which are free, so listen in. You can connect with Murray through LinkedIn, Twitter, Instagram, and his website. Murray also created the Strengths Culture Toolkit to help teams use the Clifton StrengthsFinder beyond their initial team building event. Lisa Cummings: [00:00:10] You’re listening to Lead Through Strengths, where you’ll learn to apply your greatest Strengths at work. I’m your host, Lisa Cummings, and I gotta tell you, whether you’re leading a team or leading yourself, it’s hard to find something more energizing and productive than using your natural talents every day at work. [00:00:27] Today your guest is a Strengths expert who I wanted to bring on the show because of a conversation we originally had about sustaining Strengths on your team over the long haul. So both of us had too many experience where we sparked an interest in Strengths in organization with a speech, or the training, or some coaching, but the company didn’t have the infrastructure or resources behind it to make it part of the everyday culture. And we’re both making it part of our personal mission and our business models to support leaders in a way that helps them embed Strengths into the fabric of the company and to the everyday culture at work. [00:01:04] A fun fact about your guest’s uniqueness, we shared a crush on Lita Ford in the 1980s and we’re both drummers. How fun is that? So, Murray Guest, let’s rock this show. Welcome! Murray Guest: [00:01:17] Woo-hoo. Lisa, so good to be with you today. I’m excited to talk about Strengths, but also, yeah, we’ve got a bit of a love of rock drumming. I’m learning. I’m behind you in my skills. I know it’s all about practice, and I’m loving when we connect and you just encourage me to keep going and keep practicing. [00:01:34] And, yeah, I’ve a crush on Lita Ford and I got to see her recently play live. And to see someone that was so excited and so happy on stage doing what she loves, and I’m sure she was tapping to her Strengths while she was doing it too. Lisa Cummings: [00:01:46] Such a good metaphor for what Strengths do for you when you’re in flow and you’re just totally in your groove at work or on stage, because you love it and it shines through and it makes people want to work with you. It’s a good reason to embed Strengths into your culture, because you get to experience people like that at work. Lisa Cummings: [00:02:18:] I saw that in your Instagram, TGIM, and I thought, “Yes, that is the kind of movement I want.” So, okay, let’s talk about that from the perspective of loading up listeners with ideas for vetting Strengths into their culture because they take the StrengthsFinder assessment, maybe they do it as a team, and then they don’t mean to go back to work and put it in a file and forget about it, but it does happen. We know it does, and it’s sad because we see the spark and they know they’re going to find their flow with it, and then sometimes it can wane. [00:02:47] So I want to get into a whole bunch of actionable tips and viewpoints about how people can use this, but I do want to start everyone off by being able to hear your Strengths, so kick us off with your top five first. Murray Guest: [00:03:00] My top five: Relator, Futuristic, Individualization, Communication and Responsibility. I completed my Strengths assessment back in 2012 so it’s been five years that I’ve really known my Strengths and everyday thinking about how they sharpen and how they apply. But actually, Lisa, so like a bit of a path or a bit of a structure in my top five I just want to quickly explain that. 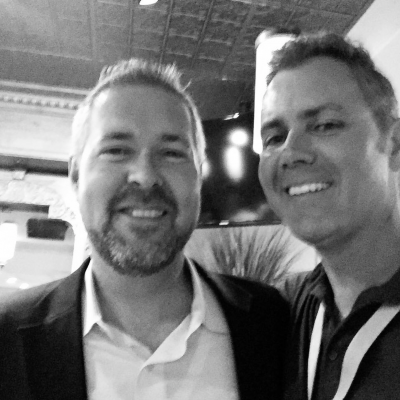 So, for me, Relator is all about building these relationships. Number two, Futuristic, where you want to go as a team or as an organization or a leader and how can we get there. [00:03:32] Individualization, how can we connect and specifically what it is for you? 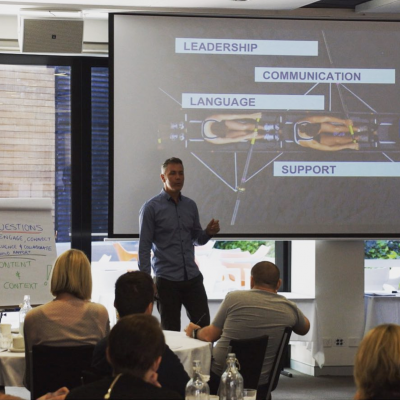 Communication then is about how we communicate that out for you as a leader or within your business, or if it’s someone running their business, how they market themselves. And the Responsibility, that’s me and it’s a foundation of how I can continue to serve you as a coach. And it’s a process, I think, that’s showing up and working for me really well as a coach. Lisa Cummings: [00:03:56] Just last week, I did a training session and we had cards where they were representing each person’s talent, and this people manager called me over and he said, “I think my Strengths in this order are like a process that I use for how I handle situations or how I think about things.” So as you were saying that I was having a flashback to this guy, and I thought, “Wow, that would be really interesting to ask people to see, ‘Does this represent like a thought flow or almost like how you operationalize how you work through challenges or situations or something new?’” Because I bet your talents do reflect an order, not necessarily the order of the Talent Themes number one through five, but an order in how they work in your brain. You might be onto something cool there. Murray Guest: [00:04:37] Yeah. Well, I love that he identified that in your course last week because I think that’s such a great awareness and a claiming of his dominant Themes. If there’s a way that we can think about a lot of what you’re saying about the thought process, or the way we might problem solve, or the way we might organize ourselves, any way that we can connect and really claim those Strengths that we have is part of the process. [00:05:02] In my previous life, I worked for an organization where what we did was psychology-based safety training. So it’s all about building a culture where people go home safe every day. So when we talk about embedding Strengths, I’m transferring a lot from what I learned from embedding what we call a safe culture where people go home safe, where leaders think about the way they communicate and they lead, and the way that people have an environment where it’s safe to speak up. [00:05:35] In that organization, I worked with a whole range of companies and about 10,000 people across some very large high-risk organizations, and one of them was a mining organization which employed about 2,000 people. This company had bought from us a couple of million dollars’ worth of training, of programs and coaching and different sorts of initiatives to develop their culture. [00:05:58] There was a maintenance team, and you would go into that maintenance team and you would swear that we’d been there only yesterday with our programs. The language, the posters, the way that they would discuss things in their meetings and look after each other, and you would actually see the results of their safety and their performance and their attitudes was actually indicative of that because of how well they were going. [00:06:23] There was another part, which is the main part of this mining operation, where you would think that we had never been there, we had never run a program, never had a coaching session with the leader, never introduced these models and tools and concepts. Lisa Cummings: [00:06:37] Same company. Murray Guest: [00:06:38] Same company. Same site. Quite a large mining operation but same company, same site. Here’s the thing. The maintenance team, we hadn’t actually done any work with them for nearly seven years. The mining operation, we’d actually been there only in the weeks before, and it was critical to how much the leaders were actually living and breathing and embedding and, I would say, just adopting the language in their everyday conversations which kept this concept or these concepts alive. [00:07:10] In the maintenance team, you had frontline leaders that are there managing these teams, day in and day out, and they had embraced it, and they didn’t need us as coaches and facilitators to come back, and you could see then that was keeping alive, day in, day out. And, like I said, we haven’t been there for seven years in that part of the business. [00:07:27] In this other main operation, being there in the weeks before, yet it wasn’t being embedded and sustained because the leaders didn’t believe in it, and they weren’t bringing into their language, they were sending people to the training courses, saying, “You have to go,” but they weren’t having, where I would say, the critical conversations before and after the programs. [00:07:49] So if there was a key insight out of all that that I really want to share is to get the value from, say, building a Strengths culture and thinking about how we actually just make it part of the way we work. We really need to engage our leaders and support them in how they just bring it into part of their everyday language and the conversations they’re having with their teams. Lisa Cummings: [00:08:11] And we’ve all seen the difference between the compliance training, where the person in the session is rolling their eyes, and saying, “Yeah, yeah.” We’re talking safety, but in reality they just want it faster and cheaper, and out in the field it’s not really going to go down like this. How do you do this with Strengths? [00:08:08:27] If you translate that, and you’re a manager who is just experiencing StrengthsFinder for the first time yourself, and you don’t know the jargon, and you don’t know the language, can you help simplify that and just give people an idea of a few things, “Hey, you’re an everyday people manager, you’re used to being an ops guy, or a finance person, or a marketing person, or something like that”? How do you start embedding this in your daily talk and conversation when you don’t know the language yet? Murray Guest: [00:08:55] I break up the culture into four areas, the culture within organizations: systems, environment, the leadership and their attitudes. To help us have those conversations and make it easy, I think one of the little things we can start to bring into those four areas so it’s really easy to have those conversations. For example, if I’ve got a diary and I’m going to meetings with my people, what are the Strengths references I can put in there? [00:09:20] If I’ve got a notice board or a whiteboard in my office or somewhere in that team area, what can we stick up there to remind us of Strengths and the Strengths language? As a leader, how am I investing my time when I’m not talking to my people to learn about Strengths? So this podcast, you’ve got a fantastic podcast, and also things like the Called to Coach that Gallup put out. They are resources that, as leaders, tapping into those when I’m not in front of my people, traveling to and from work, they’re great to actually start to learn and get some deep insights around Strengths. [00:09:52] I also think asking people questions is one of the most powerful tools in a leader’s toolkit. Asking people about their Strengths, how they’re showing up, what do they want to get out of knowing about their Strengths? And then once people are starting to experience Strengths, whether it’s through workshops or coaching, ask them how actually it’s helped them, what’s come up for them, how have their Strengths shown up for them in the past? Lisa Cummings: [00:10:36] And you’re breaking down those four categories and talking about things like systems. Instantly I thought of things like the HR systems where I’ve seen some people in their HRIS where they do performance reviews and where they have their talent information or talent management system, where they actually put in top five talents or they put in some of the career aspirations related to Strengths, or they link the Strengths conversation into the development plans, and they’re building it into stuff that already happens in the organization. [00:11:06] You know, when you said the diary, my ears perked up. And I know some Americans who are listening their ears perked up because they were thinking of a journal kind of diary, so you’re talking calendar kind of diary, right? Lisa Cummings: [00:11:28] [laughs] I had to call that out because I know it’s fun language barrier we have. Murray Guest: [00:11:31] If you’re doing that and write in your journal that’s fantastic. Lisa Cummings: [00:11:33] Could be. A lot of “Dear, Diary,” good stuff about Strengths for sure. But even in the calendar, making that part of the system where if you can’t remember this stuff as a manager and it seems like it’s just such a heavy load because you’re busy, just having a quarterly meeting that you put on a recurring cycle that is a Strengths one-on-one, and you just had the language showing up on someone’s calendar that’s a Strengths one-on-one, that alone holds you accountable to think of a couple of questions, I’m going to ask them about their Strengths in this meeting. Murray Guest: [00:12:00] Yeah, and your link to the HRIS, I totally agree. I was with a client earlier this week and we’re talking about their annual performance reviews. I said to him, “How about we put a question in there which says, ‘How have you used your Strengths to achieve your goals?’ or, ‘How have you applied your Strengths to develop this year? How will you apply your Strengths in the coming year to achieve our strategic plan?’” Those little prompts in that performance review and those planning guides are just keeping Strengths alive and will get people thinking about it, and not just in that discussion but the preparation and the follow-on as well. Lisa Cummings: [00:12:35] And maybe help people not dread the performance review season and just think of an outgoing conversation. Murray Guest: [00:12:40] I bet that’s a whole lot of conversation. Lisa Cummings: [00:12:43] I know. That could really derail us into a whole separate interview. We’ll do that one next time. So give me a couple more for managers, because I think, as you mentioned, they are a linchpin in all of this to keep it going. So you mentioned environment, say a little about what you can do to have Strengths around your environment and keep the thought of Strengths alive in people’s minds. Murray Guest: [00:13:08] One of the best things I’ve seen, and I love this as an initiative, is building a Strengths wall in your team environment. What I’ve seen, Lisa, is the very simple one where it’s just pieces of paper. And I’ve seen some very elaborate ones where people are getting photos taken, they’ve got a board that goes into a frame, and on that board next to their photo they’ve written their top five Strengths and how they’re applying their Strengths to achieve their goals, or how they’re using their Strengths to be more successful in their roles or to serve the team. [00:13:39] And so these Strengths walls have been led by leaders who’ve said, “Right, let’s just keep this alive in our area.” And so whenever anyone new joins the team, they get put up on the wall. If anyone thinks, “How am I going to work on a project, or who am I going to collaborate with and draw on their strengths?” Here’s this great wall, the pictures of our team members and their top five and how they can really use them to be successful. [00:14:06] In the environment, when I say that I mean it’s the physical environment, things you can touch. We can do certificates on the wall, and we can do top five on our desks and things like that, but I think this next level with the Strengths wall provides that deeper understanding about the individuals that make up the team. Lisa Cummings: [00:14:24] Mm-hmm. I like that a lot. And the deeper understanding point, I’ve seen some of my clients go deeper in a way that was really cool. Like I’ll provide in a training these four-by-six frames that have people’s talents so that, beyond the training event, they’re on their desk and they look nice and they can filter their thinking through them. But then they take it further, and one of my clients, I think it’s really cool, they have started to essentially hashtag their talents when they see it in action. [00:14:54] For example, this woman had Positivity talent. She needs to put her headphones on and go into her kind of crank it out mode and not be disrupted, but she hates making people feel like she’s shutting them down, and so she’s really interruptible because she has Positivity, and it’s fun to have fun at work. And so she made this really clever sign that goes on the back of her chair about how she has her headphones on. Murray Guest: [00:15:39] I love the #Talent so I think that’s great. I’m going to borrow that one. There’s assumptions that we make as humans, and here’s an assumption that I might make that, “Oh, because one of my team members had their headphones in that it means X, Y or Z.” But with this little message, and the #Positivity, it’s taking me back to Strengths, but it’s also removing these assumptions. I love it. And I love these little things that we can do in organizations which actually don’t costs a lot of money, or it don’t costs anything, and they can have such value and such impact in developing the Strengths culture. [00:16:12] Speaking of leaders, Lisa, one that I really want to share, too, is what I called a Strengths leadership commitment. Leaders taking that time to write down what’s their commitment to keep Strengths alive, to acknowledge and embrace the Strengths in their team members, and actually signing that and then putting on display. Lisa Cummings: [00:16:53] I love how it speaks to the accountability that you’re putting out there. I’ve never seen anyone do that, and I haven’t suggested that one yet, so cool. Thanks. We’re borrowing all sorts of good ideas from each other. Because, once you put that onto them, of course, then they’re going to hold you to it, and that’s why you’re telling them, and putting it out there. [00:17:38] And they’re not doing it to be unsupportive, they just kind of think, “Oh, there’s this version and that version.” And really talking through the message that sends to someone who is an individual contributor on the team, thinking, “My manager doesn’t even care to hear what I have to say about my Strengths in here. They don’t even want to understand what we do when we’re at our best when we’re in the session.” All those assumptions and things that are going on in their head. Murray Guest: [00:18:22] Yeah, and I’d like to think, Lisa, everyone has good intent. So, as a leader, “I have good intent. I’m busy. I want my team to do this. I think it’s great. I believe in it. But, hey, I’m too busy. I want to do other things or I’ve got somebody else, and we’ll go to a different program.” So there’s good intent. However, the way it’s communicated, or the assumptions team members might make might be, like you’re saying, “We’re not part of the greater team, or they don’t really care.” And so breaking down those assumptions is so important. [00:18:49] Something that I’ve actually found that’s really helped is when we do need to do that because the leader might have lots of teams, is having a leader open the sessions, so come in and explain, “These are my top five Strengths. This is what I got out of knowing my Strengths. This is what I hope you get out of it, and I look forward to hearing about it, please come tell me.” And having that sort of 10-minute opening has also been really powerful. [00:20:38] And it’s only a very short discussion, but it sets these habits, and once we form these habits that’s just going to be part of the way we work. So what if that was a standing agenda or item at the start 1of every team meeting? Lisa Cummings: [00:20:52] Beautiful. And it could five minutes or three minutes, it could even be one person’s one Strengths share and that’s it. Murray Guest: [00:20:57] Yeah, that’s right. Lisa Cummings: [00:20:59] Oh. I’ve had a client recently do this where they were passing around the responsibility of the opener. They were doing something very similar to a Strengths share but it was more like a, “What is the question related to Strengths we’re going to open the meeting with?” And it’s something that would take like 30 seconds to report out each person so that it only took up a few minutes at the beginning. [00:21:19] And they assigned a new person who would come up with that question each time. So it wasn’t just on the manager, and it got everybody really involved in it, and it made each person think about Strengths in a deeper way. I thought that was a clever way to do it, and involve everyone and really embed it further. Murray Guest: [00:21:36] Again it’s another great example and I love that. It’s just simple, it’s short, it’s effective, it’s building habits, and it’s setting the tone, I think, also for the rest of the meeting. Then, as we talk about other topics or things that we may need to discuss, it sets this tone that Strengths is going to be part of the way we do that as well. [00:22:25] So what that turned around in their meetings was, “Actually, here’s the next initiative we’re doing. Hey, Jane, can you tell us what you think could be some of our possible pitfalls and how we can address them?” It just changed the whole dynamics of the meeting and actually how engaged she was in the conversations. Murray Guest: [00:22:45] I love it. Yes. Lisa Cummings: [00:22:47] Hey, I think it would be fun if we could do the last two minutes of this episode trying to kind of lighting round out some cheap or free things that we’ve seen people use to keep Strengths alive in an ongoing way. What do you think? Murray Guest: [00:23:01] Yeah, great. Let’s go. Lisa Cummings: [00:23:02] How about you do one, I do one. You do one, I do one. We’ll just go as fast as we can. Lisa Cummings: [00:23:21] Hmm, neat idea. How about virtual meet-ups for remote teams who don’t get to see each other in person, once a quarter, totally dedicated to a Strengths chat for one hour, Brady Bunch style show in your camera? Lisa Cummings: [00:23:56] And then they start using metaphors like you do about mountain biking, how it’s related to Strengths, yes. Lisa Cummings: [00:24:01] Let’s say on-boarding someone new. Assign someone, a Strengths champion or a success coach, so somebody else who’s already in the company feels accountable to help that person unleash their Strengths at the company. Murray Guest: [00:24:16] Nice. Love it. Here’s one that one of my clients did recently where they actually asked everyone in their team to send to a neutral person a song that they love and how it reflects one of their Strengths. Then, at their monthly team meeting, they had a playlist and they played the songs, and people had to guess whose song it was and what Strength it was related to. And they all had a dance in the meeting and then they just went through them quite quickly and had this huge energy. Lisa Cummings: [00:24:45] Wow! This is going to be good. So now you’re going to challenge me to end on something really fun like that because that would be awesome. Okay. A costume party, so this could be if the Halloween time is near, or a kickoff meeting, or something where people might have an occasion to dress up. So it would have to be an event, and you dress up representing one of your talents. Murray Guest: [00:25:09] Love it. So what would you be dressed up as, Lisa? Lisa Cummings: [00:25:12] Hmm, I think what just immediately comes to mind is probably like a big old giant full-body costume sunshine that would represent positivity talent. That’s kind of the give-me obvious one. So I might get a little more cerebral and think of something more clever. How about you? Murray Guest: [00:25:29] Responsibility comes to mind, it’s like a foundation talent of who I am. How I dress up as Responsibility, I’m not too sure. Maybe goody-two-shoes school student or something doing the right thing, maybe something like that. Lisa Cummings: [00:25:44] Goody-two-shoes. [laughs] So that would be so fun and you’d be trying to look at the other person and go, “Okay, I’m sort of getting this vibe. I don’t know.” Yeah, that would be a lot of fun if you had to mix and mingle where you could talk about that. [00:25:58] Well, this is pretty cool. Man, there are so many more ideas, and I know that you have a Strengths toolkit that actually takes people through way more than just these tools and tactics but the whole process for working at a company level, how you would walk someone through embedding Strengths into your culture. Tell them where they can find your Strengths toolkit and where they can connect with you when they want to see more of your content. Murray Guest: [00:26:24] Thanks, Lisa, and I loved chatting with you today. So, yeah, I’ve created a toolkit because I, like you, am passionate about people getting the most from any training or intervention and definitely about Strengths. That’s been such a powerful thing in my life the last five years and continues to be every day. So if you go to StrengthsCultureToolkit.com there’s a toolkit of resources you can get there which includes guidelines, templates, facilitator guides, activities, there’s a conversation template, posters. And the idea is to have that toolkit of resources to help keep Strengths alive in those areas of culture we discussed earlier. [00:27:03] If people want to connect with me, my business is InspireMyBusiness.com, and you can send me an email there or check me out on LinkedIn, and definitely I think that if we can all live an inspired life through our Strengths every day it’s a very good place we live in. Lisa Cummings: [00:27:18] Thanks, Murray. Man, you guys, Murray is the real deal. He’s born to be a guest on the show because his last name is Guest. I mean, how perfect is that? So check out his toolkit. He really knows this stuff inside and out, and is so great on the consultancy side, and has done it. Now, I even get the deeper layer, seeing that you did it for the safety consultancy as well, so wow. Yeah, with that, you guys, go check out the Strengths toolkit. [00:28:05] So with that, thanks everyone for listening to Lead Through Strengths. Remember, using your Strengths makes you a stronger performer at work. And if you’re putting a lopsided focus on fixing your weaknesses, and fixing your team members’ weaknesses, you’re choosing the path of most resistance. So claim your talents and share them with the world.